Fusion. "The process or result of joining two or more things together to form a single entity". The general dictionary definition of the word applies perfectly to the music genre as well – it’s a mix of disparate elements from several genres that, put together, make perfect sense. In a seamless merge, it combines the complexity of jazz, the groove of funk and the raw power of rock, particularly when it comes to the drums. In the Fusion Fills MIDI pack, drummer Luke Oswald builds on his earlier release, Fusion Grooves MIDI, and delivers in excess of 700 individually performed fills. 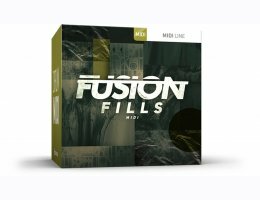 This is the ultimate collection of fills for all owners of the Fusion Grooves MIDI pack as well as any writer in need of solid fills for any backbeat-driven fusion or busy, jazz-inspired rock. Expect a collection of fills, oozing of that genre-typical technicality and subtlety. All the traits you’d expect are there; the intricate ghost notes, the busy leading-hand work and all that sophisticated "session drummer" finesse that only a great performer can muster. If legends like Vinnie Colaiuta, Dave Weckl, Will Kennedy and Steve Gadd or contemporary players like Lil’ John Roberts and Mark Guiliana get your creative nerve going, this one’s for you. Start writing! A working version of EZDrummer 1 or 2, or Superior Drummer 2 and above.